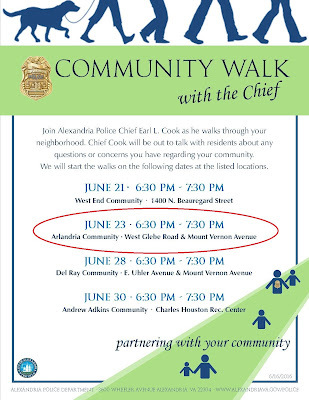 Summer is back and so are the Alexandria Police Department Community Walks! Join Police Chief Earl L. Cook as he walks through your neighborhood. 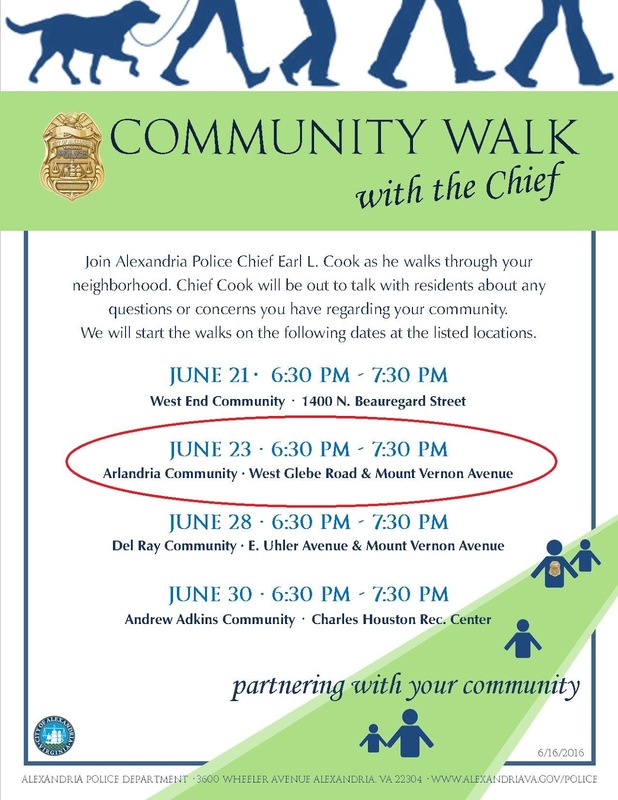 Chief Cook will be out with a variety of APD staff to talk with residents about any questions or concerns you have regarding your community. Tonight's edition hits Arlandria: gather at 6:30pm at the intersection of West Glebe Road & Mt Vernon Avenue! On Monday, June 27th at 7:30pm, the Traffic and Parking Board is holding a Public Hearing in Council Chambers, City Hall, 301 King Street. The agenda (see Docket Materials) includes discussion regarding the placement of a Capital Bikeshare Station in Arlandria. One potential location is on Bruce Street near Mount Vernon Avenue, next to MOM’s Organic Market, which would require the removal of one parking space. 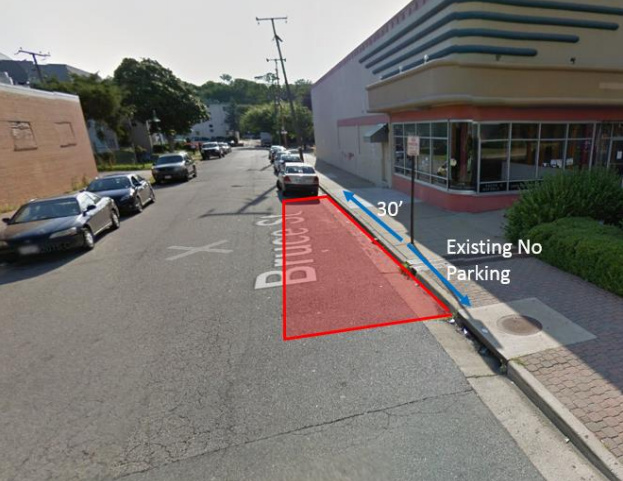 The goal is to keep the Bikeshare Station close to Mount Vernon Avenue so that it is visible and accessible to community members. If you have questions, you can direct them to Hillary Orr, Complete Streets Program Manager or Ray Hayhurst, Complete Streets Coordinator. If you would like to speak during the Public Hearing, please complete the attached form and submit it to the Chairman prior to the meeting’s start. Speaker forms will not be accepted after 7:45 p.m. The North Potomac Yard Small Area Plan Update Advisory Group will hold its fourth meeting on June 27 at 7 p.m. at Charles Houston Recreation Center, 901 Wythe Street. The purpose of the meeting is to review and receive community feedback on the concept options with a focus on the Potomac Yard Metrorail Station zone. All meetings of the Advisory Group are open to the public and community members are encouraged to attend and participate. Project materials and background information can be found on the project website. Questions? 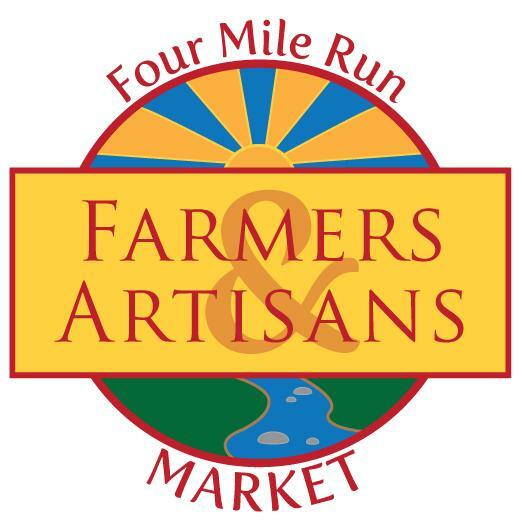 Contact Richard Lawrence, Project Manager, 703.746.3849.